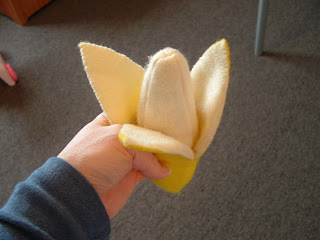 My kids love, LOVE, LOVE bananas, so they were pretty high on my list of felt food to make. I thought a pealable one would be a lot of fun. 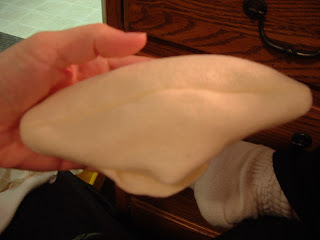 I found a great tutorial on Just Stuff via Felt-O-Rama's felt food tutorials links (on the left sidebar of her blog.) While you're at Just Stuff be sure to check out the way she modifies this pattern for a corn in it's husk, and she also has some other great looking felt food to inspire you. I started by making my pattern. I just guessed, made sure it was symmetrical and hoped it would come out right. I had to tweak the directions from Just Stuff based of my shape, but if you use my printable it should take some of the guess work out of figuring out your own. I started by cutting out four yellow pieces and 8 cream pieces. This is what you'll need to follow the directions on Just stuff. Because I modified the design, I ended up only using 3 yellow pieces and 7 cream pieces, and you could actually get away with just 6 cream pieces as you'll see later on. 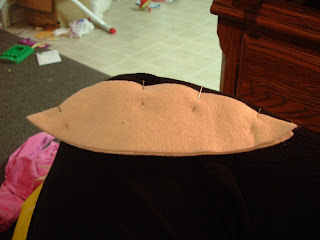 I sewed four pieces together this way, leaving an opening in the middle of one side for turning it right side out. NOTE: When I got to this point though, I didn't like the shape of my banana. It looked way to fat in the middle and also too symmetrical. 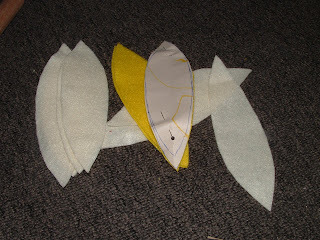 To fix it, I went back and resewed the last seam (the one with the opening) as you can see here. It's an almost straight seem that cuts off about half of two of the sides. (You could also just sew three sections together. This would look a little more symmetrical than what I did, but would take any guess work out about where to sew the final seam. 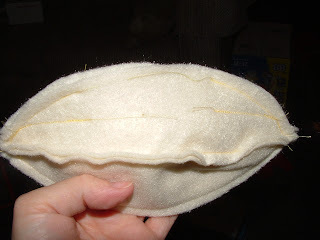 You could trim the extra...I just left it there to act as some of the stuffing and turned it right side out. I didn't bother trimming any of the seam allowances for the banana because I think it actually made the ends look more banana-like. 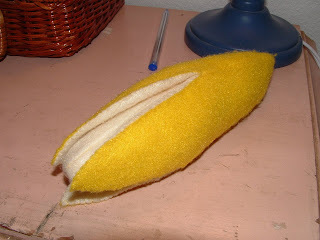 Then I stuffed the banana with chopped up felt (lighter colors, so dark pieces wouldn't show through). 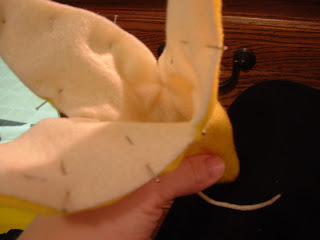 Since my banana was a lot slimmer than four sections, I just sewed three sections together to make the peal. 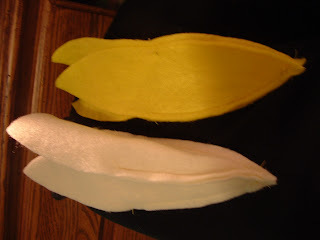 I sewed three yellow sections about half way up and then three cream sections together half way up. 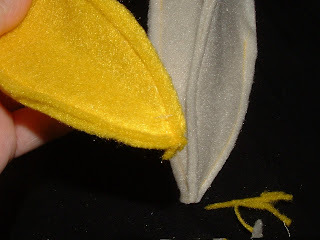 You want to be careful to use the same seam allowance or just slightly smaller than for the yellow part since it will be on the outside. For the peal I DID trim the same allowances (especially the tips) because they needed to fit inside each other. ...And you can see my kids' super ugly (but free and well built!) dresser nicely in this picture. Stay tuned to see this featured in a repainting/facelift post...but not until the summer...when there's no school and it doesn't rain. 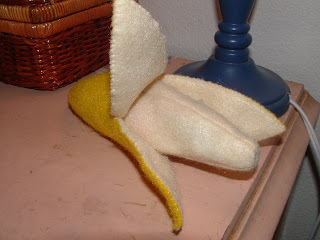 Click here for the Printable Felt Banana Pattern. My oh my, you have inspired me to try all your crafts. I been doing carrots have not done the stawberries but are next on the list, but this banana is wonderful insperation. 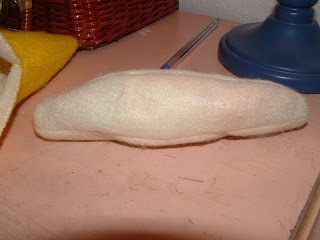 I was thinking it could also become a corn but to sew all the cernals; that be time consuming but worth the the try. Keep up the wonderful crafts coming we love all crafts. Mmmmm...to quote Boy....I'm just getting ready to eat my lunch banana! You have given me a new appreciation. 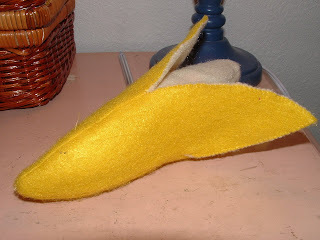 The felt banana looks wonderful. Hi, I'm the creator of the original tutorial linked up top. Thank you for mentioning your corn Lyneya! I had meant to say something about it, but it was late and I was tired as I was finishing the tutorial. (Obviously since I also forgot the pattern.) I'll put a note in about it as well as the rest of your felt food because it's all worth looking at. And thank you to the rest of you for your comments. I'm glad you're enjoying the felt food. 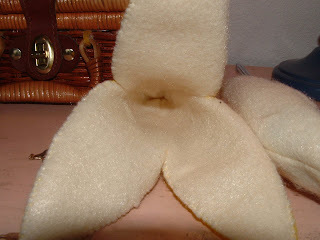 Good morning, I like your blog very much, I therefore classified it on mine for the best blogs offering felt food pattern or tutorial.